Our Company spread in Area of 11,780 sq. Mtrs is based in Industrial Area, has an easy access to State, National highways and Dry Ports. With a total Area of 8,634.30 Sq. Mtrs for our Workshops, Heat Treatment Shop, Quality Assurance Division, Testing & Calibration Laboratories, Godowns for raw material and finished goods and Administration Blocks. We are capable of handling a large array of job sizes without any bottle necks on floor. All of our workshops and yards are well equipped with EOT Cranes & Electric Hoists with lift capacity from 1 MTs to 5 MTs, with a Floor Height of 25 Feet’s. Being certified ISO 9001:2008 and APIQ1, we meet all Quality Standards and have an Extensive Quality Management System in place to ensure all production systems are performing to their maximum potential. Our Quality Management System is constantly striving to improve our efficiency and changes required to meet all of our Customers Specific Demands and Modern Manufacturing Standards. Quality checks from Raw Material to Finished Products are done using our comprehensive range of in-house testing facilities with a dedicated machine shop for specimen preparation. 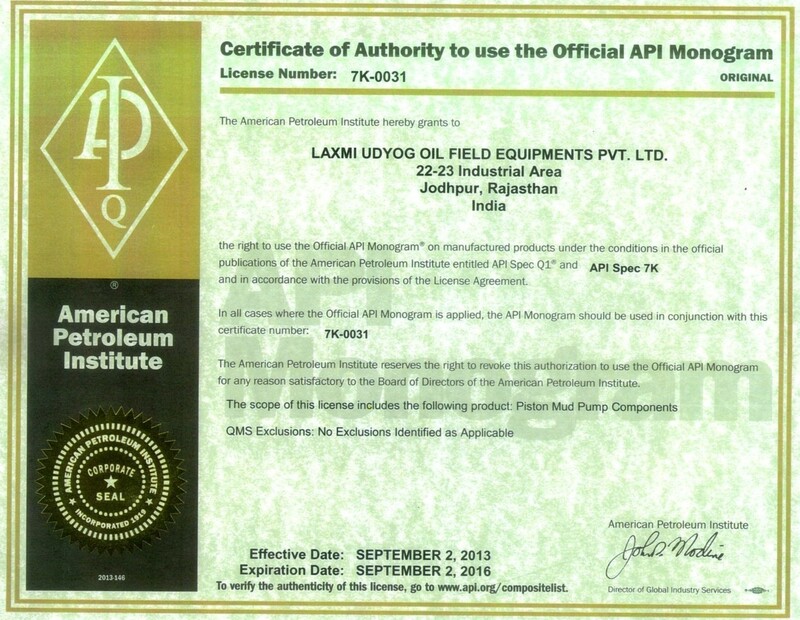 Tests are conducted as per API, ASTM, ANSI/ASME, NACE, MSE and ISO 9001 Systems. Our Quality Control Testing Lab is well equipped with precision measuring instruments and special gauges along with facilities that includes; Mechanical Properties Testing Machines like UTM, Impact Testing Machine, Fatigue Testing Machines; Non Destructive Testing like, Dye Penetration Test Equipment, Magnetic Particle Test Equipment, Ultrasonic Flaw Detector etc., Specialized Metallurgical Laboratory with Test Equipment for Chemical composition and Micro Structure Analysis of materials. 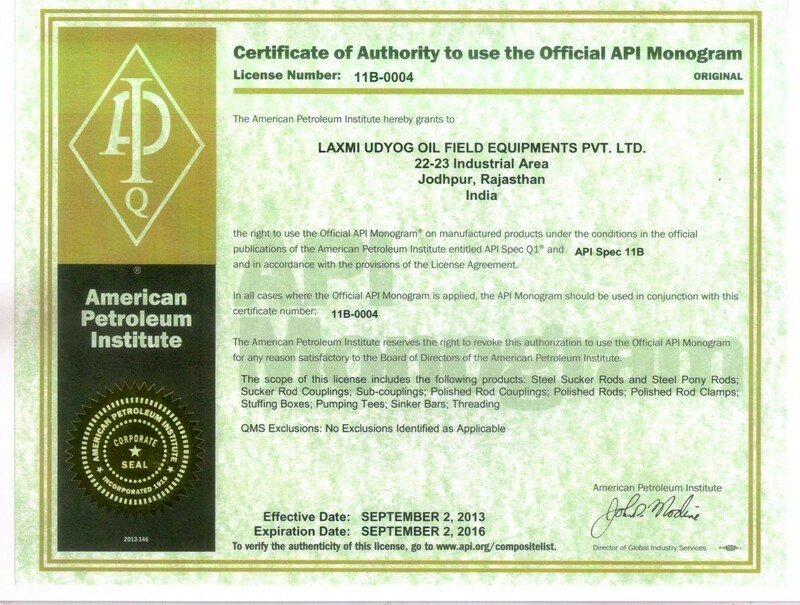 We with a Strong Research & Development Capability, started with 100% indigenization of Import Substitute of Critical Oil Well Drilling Rig Equipments in early 70's. Over the period of time, We have further strengthen our Research & Development Division, which is dedicated to design & development of new products and assembly parts using industry leading CAD softwares for drawing and designing them. We work closely with our clients and understand their requirements and transform them into final product by designing and consequently manufacturing any part or assembly at our facility. Our expertise lies in understanding material flow, machining options, forging techniques for any complex part / assembly to ensure the most economical and efficient way of production. Our Skilled Work Force is the one of the biggest asset we possess. 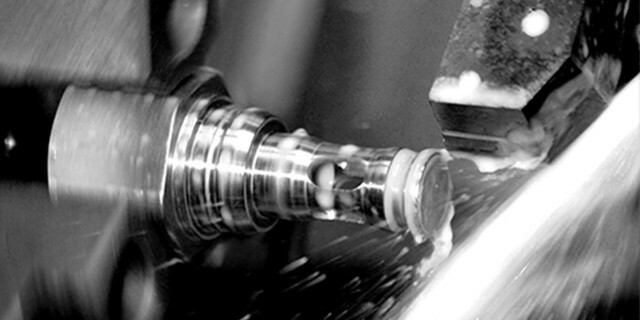 We are a Team of Engineers, Technicians, Skilled Machinists & Workers with more than 30 years of Industry Experience. Over the years, we have Innovated and Developed many key components and parts/assemblies either as import substitution or which were brought to us as an idea by our clients to technically upgrade themselves. Our Metal Turning Facility includes; Specialized CNC turning Centers for Precision Machining, Heavy duty Lathes, Turret Lathes, Horizontal Boring Machines, Deep Hole Drilling Machines, Radial Drilling Machines, Planner Machine, Slotting Machine, Cold Thread Rolling Machine, Milling & Shaper Machines and Special Purpose Machines. Our Versatile Sheet Metal & Fabrication Facility in-houses machines capable of doing tasks like Punching, Rolling, Blanking, perforating, shearing, bending of Metal sheet. It also includes, Profile gas cutters, Arc Welding equipments, MIG welding machine and Spot Welding Machines. Our Metal Forming Facilities includes a gamut of Power Presses ranging from 25 MT to 300 MT, Drop Hammers of 1000 Kgs, Double Head & Triple Head Upsetting Machines of 200 MT capacities, Long draw benches & Shearing Machines. Full Fledged Heat Treatment Facility capable of Annealing, Normalizing, Carburizing & Hardening various grades of steel. Heat Treatment Shop consists of Induction Heat treatment plants, Special purpose furnace for continuous heat treatment, Box Type Furnaces, Car Bottom Type Furnaces and Roller Type Furnaces. Our Specialized Surface finishing Facility includes complete sets of External Cylinder Grinding Machines, Eccentric Grinding Machines, Internal Cylinder Grinding Machines, Center less Grinding Machine, Honing Machines and Shot blasting machines. This facility has capability of Precision Grinding and producing products with surface finish in close tolerance of 10 Microns. Our Paints & Coating Facility comprises of an Automatic Continuous Powder Coating plant, spray painting machine, Paint Stoving Ovens and Phosphating Plant. Our Packaging & Dispatch Division comprises of a carpentry workshop responsible for designing and making Fumigated Wooden Boxes, Crates & Pallets for packaging Just-in-time as and when required. Along with Wooden box packaging, we also do flexible packing (Polypropylene, LDPE or HDPE packaging) as per customer requirement. To ensure undisruptive production and meeting tight deadlines, 24 hours power is backed up by our Diesel Generators of 380,240,240 KVAs to counter power failures from Grid Stations. 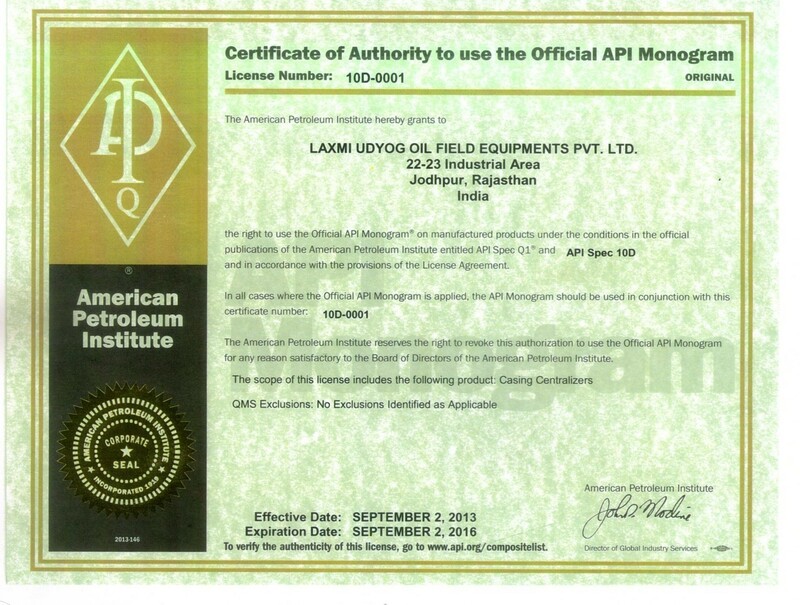 Experience of over 4 decades of High Quality Production of Critical Oil Well Drilling Rig Equipments, Mining Equipments & Other Engineering Equipments, while helding Industry Reputed American Petroleum Institute (API) Licenses since last 25 Years. VIEW OUR QUALITY CERTIFICATIONS link to view certificates and licenses, put this somewhere on page. 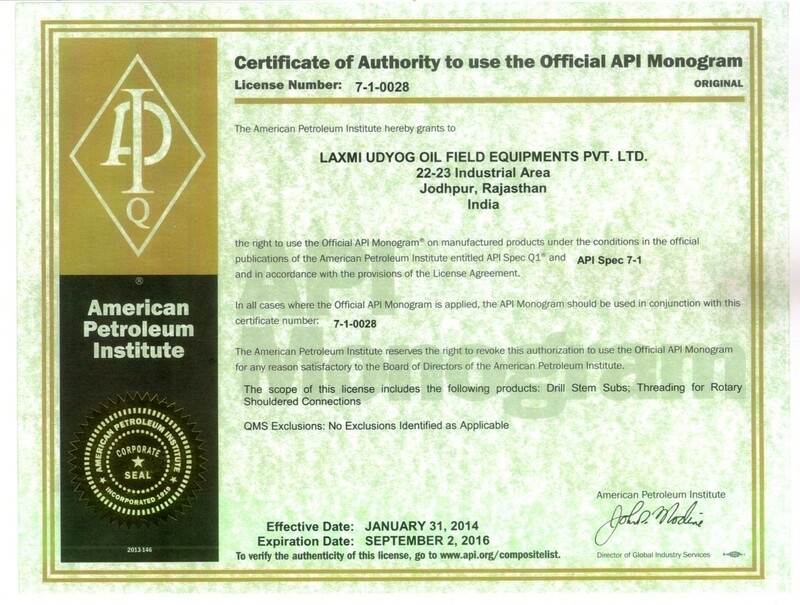 Being certified ISO 9001:2008 and API QR, Laxmi Udyog meets all Quality Standards and have an Extensive Quality Management System in place to ensure all production systems are performing to their maximum potential. 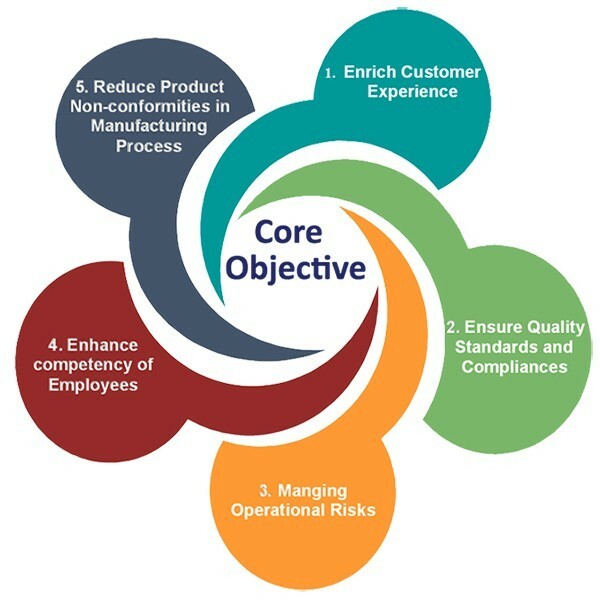 Our Quality Management System is constantly striving to improve our efficiency and changes required to meet all of our Customers Specific Demands and Modern Manufacturing Standards. 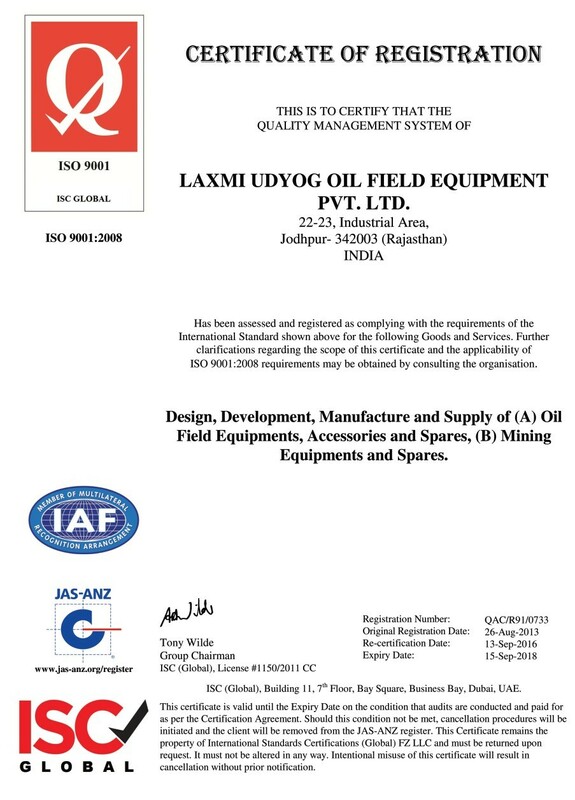 Laxmi Udyog strives to manufacture High Quality Products and Enrich Customer Experience through Prompt Delivery, Better Product Quality and Response to Meet & Exceed Customer Requirements by incorporating Continual Improvement of its process in conformity to API QR & ISO 9001 : 2008 .